The Friends of the Rutherford Pool, Washtenaw County Parks and Recreation and the City of Ypsilanti all came out winners in their bid for grant dollars to fund two significant recreation projects. The city submitted grant applications on behalf of the Friends and Parks and Rec Commission for the rebuild of the Rutherford Pool and a pedestrian bridge over the Huron River that will be a key component of the Border to Border Trail in the area. 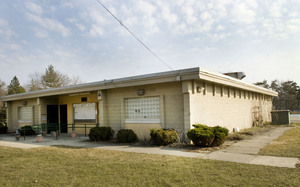 The outside of Ypsilanti’s Rutherford Pool is seen in this file photo. She said ground will be broken on the $625,000 project sometime in early spring 2012, and the pool, 975 N. Congress St., will likely be ready for use by summer. The group was able to secure several other grants and raise the additional $325,000 since it started working on the rebuild effort in 2010. The city ceased operating the pool in 2003 when the parks and recreation department was dissolved. Since then, the Friends entered into a “mutual management arrangement” with the city. Problems with the nearly 40-year-old pool, which was expected to last 20 to 25 years, include a torn liner, leaking main drain underneath the pool, “underground heaving” causing an uneven pool floor, wiring and plumbing issues in the building, possible crumbling of one corner in the pool and an uneven pool deck. Wozniak said the Friends still want to raise a little more money to cover any contingency costs during construction and are gauging whether the community would support an eight-lane pool, which would require some additional fundraising. The Friends also must provide a business plan to the city to demonstrate how it will manage and maintain the pool in the future. Wozniak said that plan is almost ready to present. The Parks and Recreation Commission is providing $275,000 of its own funds for the $589,000 pedestrian bridge project, which will connect the Border to Border Trail from Riverside Park to the Water Street property underneath the Michigan Avenue bridge. The link would complete a larger segment of the trail in Ypsilanti, and is a high priority in the Ypsilanti Parks and Recreation Commission’s master plan process. The most recent segment completed was a gravel trail along the Water Street property. Washtenaw Parks and Recreation director Bob Tetens declined to comment on the pedestrian bridge. City Council was forced to decide which project to give priority when submitting the applications, which provided for a tense moment in the city. But council members were excited to hear both projects were awarded money. Council Member Pete Murdock expressed similar feelings.